committed were a divine right and duty. Now this yarn does have a spot of truth in it. The Thugs (practitioners of Thuggee), were often related. Thus, the ties that bound the cult together were often close familial ties. Add to this the fact that the cult had its own secret language called Ramasee , which was based on ancient Persian and that in time the cult became connected to families of wealthy landowners, and you can see how these weird, grisly beliefs took root and grew so successfully. Language was important because there are over one hundred tongues native to India. The common language which the English imprinted on India was in some ways a great service for the Indian nation’s development: it enabled large groups of Indians to talk to one another. Thuggee was remarkable, too, because it comprised Hindus and Moslems. So even in this bizarre cult, there were positive elements. 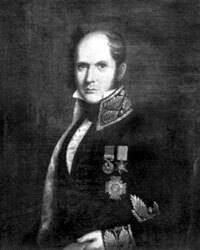 In 1839, William Sleeman, a British officer, was made head of efforts to expose and suppress Thuggee. He was enormously successful and is known to history primarily for this reason. An account of Sleeman’s work, almost completely factual, is to be found in Philip Meadows Taylor’s book, Confessions of a Thug. Taylor was himself a Thug hunter and knew his subject very well. Less well-known and now rarely adverted to is the opium trade which was based in India and developed and managed by the British. In Victorian times, trading in opium was not a crime, except in China, Britain’s primary market for the drug. Opium factories were set up in Patna and Ghaziapur. The opium produced was sold to the Chinese to equalize the balance of trade for the huge amounts of tea the British bought from China. 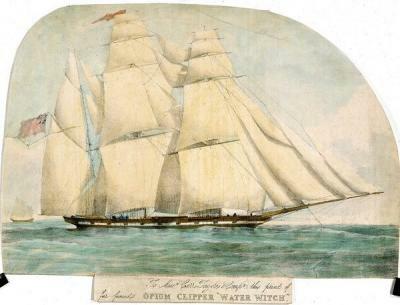 The opium was auctioned in Calcutta to “independent merchants” who used some of the fastest sailing ships ever built (opium clippers like the “Sea Witch” shown above) to get the opium past the Chinese authorities. The standard of living in Victorian Britain rested to a large degree on the sale of opium to Chinese addicts, created to a significant extent by the British efforts to market the drug. Today, Indian opium is grown in the three states of Uttar Pradesh, Madhya Pradesh and Rajasthan. There still exists a multinational company with revenues in the billions of pounds that was born directly from the opium trade. In fact, opium and the huge revenues it can generate continues to be a major factor in the politics of Afghanistan and other Asian countries. One cannot help but wonder how much smaller today’s opium trade would be if not for the actions of the British during Victoria’s reign. This entry was posted in 19th century India, victorian India and tagged British colonialism, British Raj, Calcutta, Confessions of a Thug, cult of murder, drug traffic, Ghaziapur, l murders, opium, opium auction, opium clippers, opium factories, opium production, opium smuggling, Patna, Philip Meadows Taylor, ritual killing, secret Indian cult, serial murder, Temple of Doom, thuggee, William Sleeman. Bookmark the permalink.